This document is a technical summary of the Enhanced Transportation Flow Open-source Microscopic Model (ETFOMM) software. This TechBrief describes research on the development of an open source microscopic traffic simulation software with proven traffic models, advanced computing algorithms, and a distributed/cross platform application programming interface. The research was conducted between 2008 and 2017. 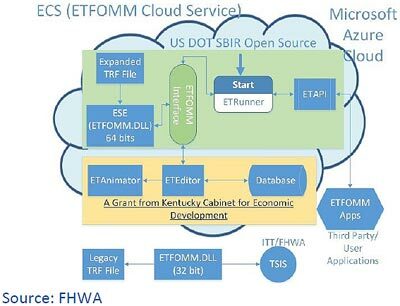 The ETFOMM (Enhanced Transportation Flow Open-source Microscopic Model) Cloud Service (ECS) is a software product sponsored by the U.S. Department of Transportation (DOT) in conjunction with the Federal Highway Administration’s (FHWA’s) “Microscopic Traffic Simulation Models and Software - An Open Source Approach” project. ETFOMM’s primary components are the core microscopic traffic simulation engine (ESE), a graphical user input editor (ETEditor), a 3D traffic visualization tool (ETAnimator), and a database in cloud service environment (ECS), as shown in figure 1. ETFOMM has been tested in a Mississippi DOT Integrated Corridor Management Project, and is being used in a connected vehicle research project at the Saxton Transportation Operations Lab at FHWA’s Turner Fairbank Highway Research Center. ETFOMM supports traffic signal controller hardware-in-the-loop simulation and will support connected vehicle communication-in-the-loop simulation. ESE is an open source software that inherits 40 years of FHWA traffic simulation algorithms and flow theories, while overcoming CORridor SIMulation’s (CORSIM’s) limitations in supporting research. ESE utilizes state-of-the-art advanced computing technologies, such as a native 64-bit stand-alone application, explicit parallel computing, and multi-processor capabilities on multiple platforms (Windows/Linux/MacOS). ESE includes the ETFOMM application programming interface (ETAPI) that provides communication between ETFOMM’s core simulation engine and user-developed applications (Apps) through ETRunner (a Windows console program). ETAPI is built on recent Microsoft Windows Communication Foundation (WCF) technology. ETAPI supports a distributed platform with multiple network protocols; is compatible with almost any programming language; and facilitates mobile computing (e.g., smartphones and tablets) and cloud computing. ETFOMM provides a robust platform and a high level of flexibility for users to advance their transportation research. ESE maintains the research community’s confidence in traffic simulation through its open source approach. Traffic simulation software is a special set of software with many human-factor-related “expert rules.” The open source approach offers the transportation research community the opportunity to examine those rules, fix bugs, add new rules, or simply avoid the misuse of the software in their research projects. Researchers are not only able to modify and add new rules to improve the software’s functionality, but also to accommodate new technologies and new traffic operation developments. Most significantly, software enhancements can be shared with the transportation research community. Figure 1. ETFOMM and its Major Components. ETEditor is a very versatile input editor that allows users to directly add roadway geometric and elevation data in order to automatically build highway and surface street networks. In conjunction with the ETEditor, ETAnimator has been created using state-of-the-art 3D visualization technologies. These advanced 3D visualization technologies have allowed researchers to develop a virtual world of traffic animation. The database has been designed and created to save simulation input and output data, and to effectively manage the large amount of vehicle trajectory data in the database. ECS is expected to profoundly benefit transportation educators and researchers. ECS is hosted on the Microsoft Azure platform, but the database can be deployed on a local server to alleviate privacy concerns. In the Saxton Transportation Operations Lab, ETFOMM is used to develop, debug, test, and evaluate innovative safety and mobility applications. An arterial traffic progression optimization model is established by changing the cycle length, split, and offset at coordinated signalized intersections. The model combines traditional traffic detection with information from the basic safety message (BSM) sent from connected vehicles; propagates traffic flow from one intersection to another; optimizes cycle length and offset; and adjusts the split in real time. The real time traffic signal timing plans are sent back to the application programming interface (API) at the actuated traffic signal controller inside ETFOMM, which generates measures of effectiveness. In a case study, the proposed algorithms outperform TRANSYT-7F by about 50 percent at major streets and at least 25 percent in control delay with connected vehicle penetration rates as small as 10 percent. ETFOMM is used to provide detector and traffic signal status updates for a DCS—originally developed by the Texas Transportation Institute—that enhances dilemma zone safety. Once the DCS decides to extend or terminate the green time to avoid vehicles being trapped in the dilemma zone, it sends the request back to the actuated signal controller inside ETFOMM. Multiple simulations and the statistical analysis of simulation results indicate that DCS reduces the number of stops and red-light runners. Detector data from ETFOMM provide inputs for a model to minimize the total freeway and ramp delay. The model outputs the speed reductions for freeway vehicles to create gaps for ramp vehicles to merge. The proposed speed reductions are implemented in ETFOMM. Evaluation from ETFOMM indicates this strategy can significantly reduce delays and increase throughput. A research paper from this project, “A Cycle-Based Variable Speed Limit Methodology for Improved Freeway Merging,” was awarded the Best Scientific Paper in the Americas at the 2016 Intelligent Transport Systems (ITS) World Congress in Melbourne, Australia. At the Department of Civil and Environmental Engineering at Mississippi State University, undergraduate students in Traffic Engineering classes learn and use ETFOMM to analyze the level of services for intersections with actuated control traffic signals and for freeway sections with weaving, merging, and diverging traffic. Students also collect field data to update traffic signal timing plans and evaluate alternative timing plans in ETFOMM. In the Traffic Simulation and Traffic Management course and the Traffic Flow Theory course, graduate students at Mississippi State create new algorithms to interface with ETFOMM. One Ph.D. student created traffic signal optimization models using connected vehicle concepts. Two other Ph.D. students are currently working to interface their traffic optimization models with ETFOMM. Pitt, intelligent driver model (IDM), adaptive cruise control (ACC), cooperative adaptive cruise control (CACC), and mixed car following logics. Compatibility with existing CORSIM 5.1 file format. Freeway diversion (Integrated Corridor Management). Lane width effect on desired freeway speed. Tested on Linux and designed for Mac OS. Complicated freeway-to-freeway direct connections without dummy links/nodes. No 8000 entry and exit nodes. Variable time steps (could be as small as 0.01 s). Allows path/turning percentage based simulation. Bus operations on surface street/freeway. Remodeled intersection vehicle movement logic. Specific vehicle movement logic through roundabouts, alternatives interchanges, and complex intersections. Built-in fuel consumptions and emission data from Environmental Protection Agency models. Multiple-core/thread Surrogate Safety Assessment Model (SSAM) conflict analysis. Multiple runs can be deployed on different CPUs simultaneously. Interfacing with enhanced FHWA Open Source Traffic Signal Controller Algorithm: SignalCOntrolProgramEnvironment (SCOPE). Standard National Electrical Manufacturers Association (NEMA) operations. Direct 3/4 diamond interchange phases. National Transportation Communications for ITS Protocol (NTCIP)-based hardware-in-the-loop, no controller interface device needed. Red light runner as a measure of effectiveness. DCS dilemma zone already built-in. Model Any Modern Network, without limitations! U – Unlimited; N/A – Not applicable. Provides both data and function for commonly used components. Multiple network protocol support (Simple Object Access Protocol, Hypertext Transfer Protocol, and TCP/IP). Cross platform and mobile interface (through HTTP/SOAP). Almost any programming language that supports WCF: C#, C++, Visual Basic, HTML, Python, etc. API functions that allow users to access and modify simulation data, such as vehicle desired speed, turn code, destination, actuated controller data, etc. API Examples show how to interface with user developed traffic signal control algorithms, lane changing/car following algorithms through ETAPI. High occupancy toll, dynamic message sign, and variable message sign. Advanced Traffic Controller and beyond. IDM/ACC/CACC car following logic built in. Integrated trajectory conversion algorithm (TCA) for BSM used with connected vehicles. Recovery functions to convert BSM to vehicle trajectories. Federal Highway Administration. “Open Source Application Development Portal: ETFOMM.” Website. McLean, VA. http://www.itsforge.net/etfomm. Last accessed December 2, 2016. Federal Highway Administration. “Open Source Application Development Portal: SSAM.” Website. McLean, VA. http://www.itsforge.net/ssam/. Last accessed December 2, 2016. NGSIM: Source Forge. (Updated 2014). “ETFOMM.” Website. https://sourceforge.net/projects/etfomm/. Last accessed December 2, 2016. New Global Systems for Intelligent Management Corp. (September, 2016). “Enhanced Transportation Opensource Flow Microscopic Model (ETFOMM).” Website. http://www.etfomm.org. Last accessed December 2, 2016. Researchers—This software was developed by New Global Systems for Intelligent Management Corporation, Contract No. SBIR DTRT5708C10060, DTRT5711C10037, and DTRT5715C10005. The principle investigator is: Dr. Li Zhang (662–341–5725, ngsim@ngsim.com). ETEditor and ETAnimator were developed under a grant from the Kentucky Cabinet for Economic Development, under the Grant Agreement, KSTC-184-512-13-155, with the Kentucky Science and Technology Corporation. ACADEMIC/UNIVERSITY LICENSE GRANTED (FREE ECS): Mississippi State University and the University of Kentucky. The FHWA Contracting Office Representative is Joe Bared (202–493–3314, joe.bared@dot.gov); contact with all questions, including those pertaining to free university-wide deployment. Distribution—This TechBrief is being distributed according to a standard distribution. Direct distribution is being made to FHWA Division Offices and Resource Centers. Availability—The publication associated with this TechBrief is “Microscopic Traffic Simulation Models and Software – An Open Source Approach,” phases I, II, and IIB Final Report and volumes I–V. It is online at http://www.fhwa.dot.gov/research. Keywords— Microscopic traffic simulation, cloud computing, traffic signal controller software, and connected vehicle research. Quality Assurance Statement— The Federal Highway Administration (FHWA) provides high-quality information to serve Government, industry, and the public in a manner that promotes public understanding. Standards and policies are used to ensure and maximize the quality, objectivity, utility, and integrity of its information. FHWA periodically reviews quality issues and adjusts its programs and processes to ensure continuous quality improvement. Keywords: research, operations, intelligent transportation systems, ITS, Microscopic traffic simulation, cloud computing, traffic signal controller software, and connected vehicle research.